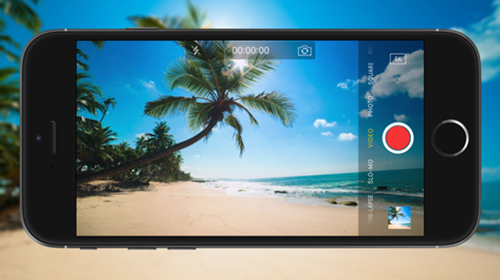 Do you have length videos on your iPhone that take a massive memory? Or do you have wonderful videos that you want to edit/process on your computer? Why not transfer videos from iPhone 7, 7 Plus, 6, 6 Plus, 6S, 6S Plus, SE, iPad Pro, iPad mini 4/3, or iPad Air 2 to computer? Read the article below to learn 4 methods to transfer&save videos from iPhone to Windows PC to free up space. 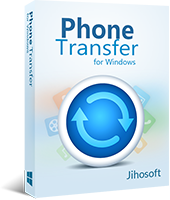 In addition to using USB cable to connect iPhone to pc and drag videos to pc, the best choice to transfer videos from iPhone to computer may be a professional phone data transfer from Jihosoft. Apart from transfering videos, this tool can also help you transfer photos from iPhone to computer, as well as other contents like contacts, messages, call history, notes, WhatsApp, etc. You can use iTunes to back up the contents including videos on your iPhone, iPad, or iPod touch. Free iPhone Backup Extractor lets you view iPhone backup files for browsing and exporting. Give a try to this freeware and export iPhone videos to your computer. 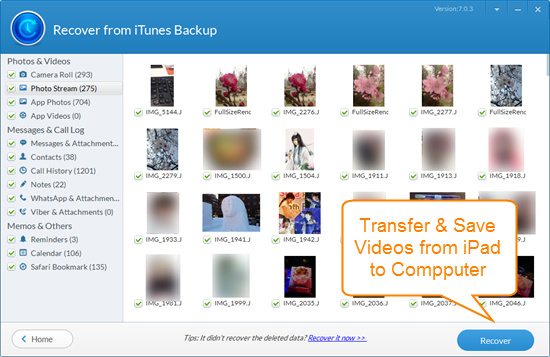 Free iPhone Backup Extractor will help you transfer both the existing and deleted videos on your iPhone/iPad, provided that the deleted videos are not yet overwritten by new data. 1.Connect your iPhone or iPad to computer using the USB cable. 2.Select “Import pictures and videos using Windows” from the popup AutoPlay window. 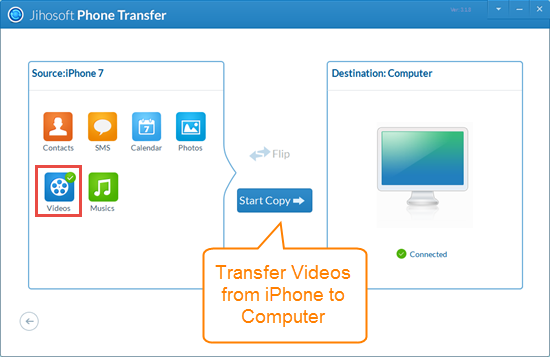 3.Click on the “Import” button to transfer videos from iPhone/iPad to “My Pictures”. Note: You are allowed to save the videos to any other designated folder or choose to erase the videos from iPhone/iPad after transfer. 1.Connect your iPhone/iPad to computer using the USB cable. 2.Go to Computer and double-click on the iPhone icon under Portable Devices. 3.Go to Internal Storage > DCIM to access the videos on your iPhone or iPad. 4.Now you can easily copy & transfer the videos to any folder of your computer. Note: Only videos that are taken with the iPhone’s built-in camera may be transferred onto the computer. Videos synced from iTunes cannot be imported.